Did you know that you can help raise money for CASA of Yellowstone County – through Facebook? 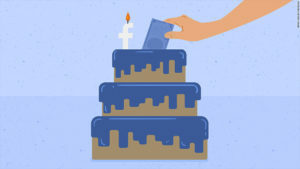 If you have a Facebook account with your date of birth listed, Facebook will send you a notification as your birthday approaches giving you the option to dedicate your special day to raising funds for a nonprofit organization of your choice. When you receive this notification, you can select CASA of Yellowstone County as the recipient, and your Facebook friends will have the option to donate to CASA! In just this past year, Facebook birthday fundraisers have raised over $300 million for charitable causes. If every person who values the work of Court Appointed Special Advocates and believes in the importance of our mission were to dedicate their next birthday on Facebook to raising funds for CASA of Yellowstone County, the impact would be tremendous – not to mention what it would do to raise awareness in the community! You can also set up a Facebook fundraiser for CASA at any time for any occasion, not just on your birthday. If you are ever interested in doing this, visit www.facebook.com/fundraisers to get a fundraiser set up in just a few simple steps, with no cost to you. As always, you can make a one-time donation to CASA of Yellowstone County just by clicking the button below. Thank you for your support!